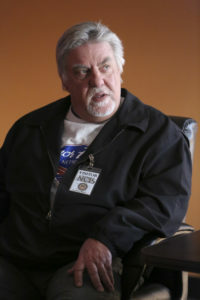 Bruce McGill guest stars as Vietnam War veteran Henry Rogers in the Tuesday, March 28 episode of NCIS on CBS. When a Marine is murdered at an event for the Honor Flight Network, a non-profit that arranges for veterans to visit the World War II, Korea and Vietnam War Memorials for free, the NCIS team must rely on an irritable Vietnam War veteran, Henry Rogers (Bruce McGill), to provide details on the victim’s whereabouts throughout the day. Also, McGee and Bishop investigate a juicy rumor about Quinn and Torres, on NCIS, Tuesday, March 28 (8:00-9:00 PM, ET/PT) on the CBS Television Network. Some photos previewing the episode can be found below. NCIS stars Mark Harmon (NCIS Special Agent Leroy Jethro Gibbs), Pauley Perrette (Forensic Specialist Abby Scuito), Sean Murray (NCIS Special Agent Timothy McGee), Wilmer Valderrama (NCIS Special Agent Nicholas “Nick” Torres), Jennifer Esposito (NCIS Special Agent Alexandra “Alex” Quinn), Brian Dietzen (Jimmy Palmer), Emily Wickersham (Probationary Agent Eleanor “Ellie” Bishop), Duane Henry (MI6 Officer Clayton Reeves), Rocky Carroll (NCIS Director Leon Vance), and David McCallum (Dr. Donald “Ducky” Mallard).